I need a GPS logger, don’t have one, don’t want to buy one, so let’s build one! I have all the necessary parts, so let’s start! I need a device that logs location, speed and course on an SD card. I could use my Android phone to do this, but the GPS would drain the battery within the hour. So let’s build a dedicated device. Because it won’t have a display, it needs to have a way to show if it has a GPS fix. 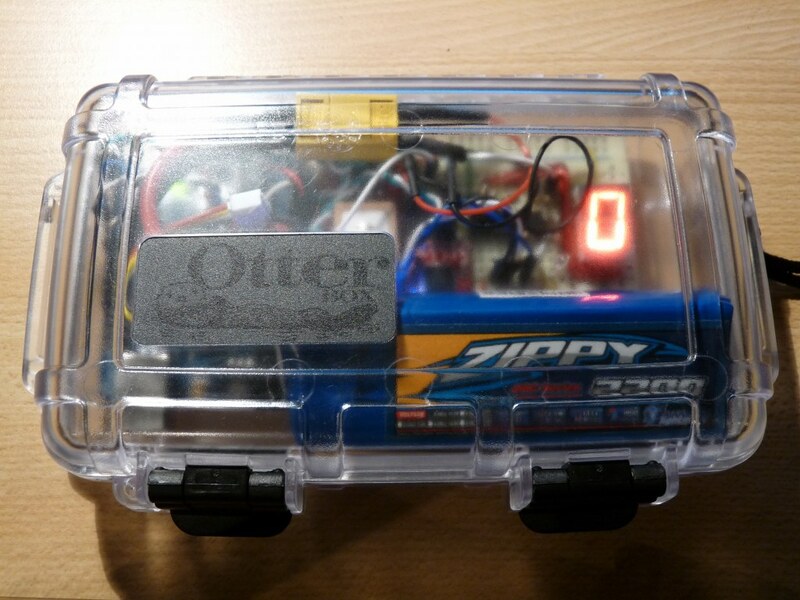 It needs to run on a 3s lipo (11,1v) for as long as possible (preferably >12 hours), but I also want it to warn me when the battery voltage gets too low because lipo’s should never be discharged below 3v per cell (9v total) or they get damaged. I gave some prices and websites where I get my stuff. Prices are constantly changing so they are just an indication. 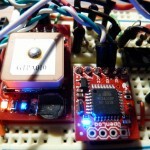 Start with connecting the GPS module to the Arduino. I will be using SoftwareSerial on digital pins 2 and 3. 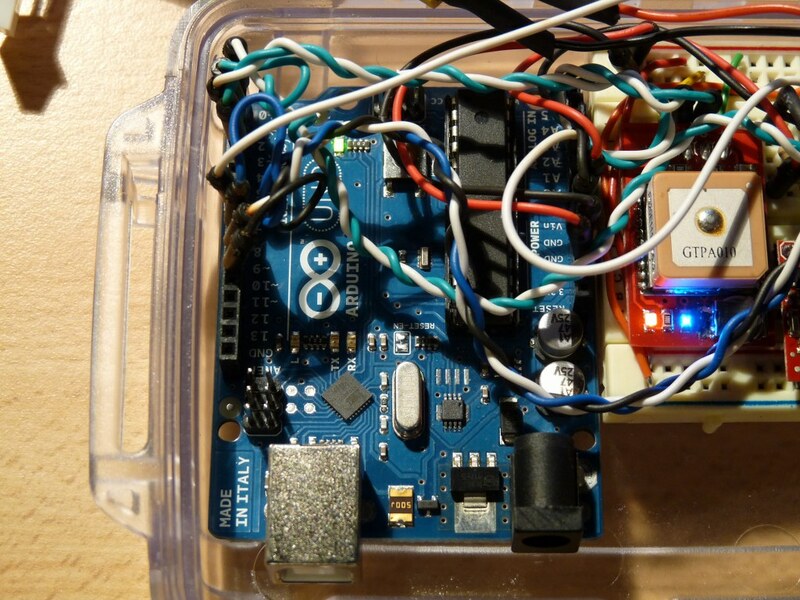 When the Arduino starts receiving NMEA sentences from the GPS, it will be processed using the TinyGPS library. Every five seconds, the data will be sent using pins 0 and 1 (hardware serial) to an OpenLog, which writes it to a micro SD card. The led digit will light up for one second showing the amount of GPS satellites it has a fix with. If it’s more than 9, only the dot will light up, telling me there’s more than enough signal. 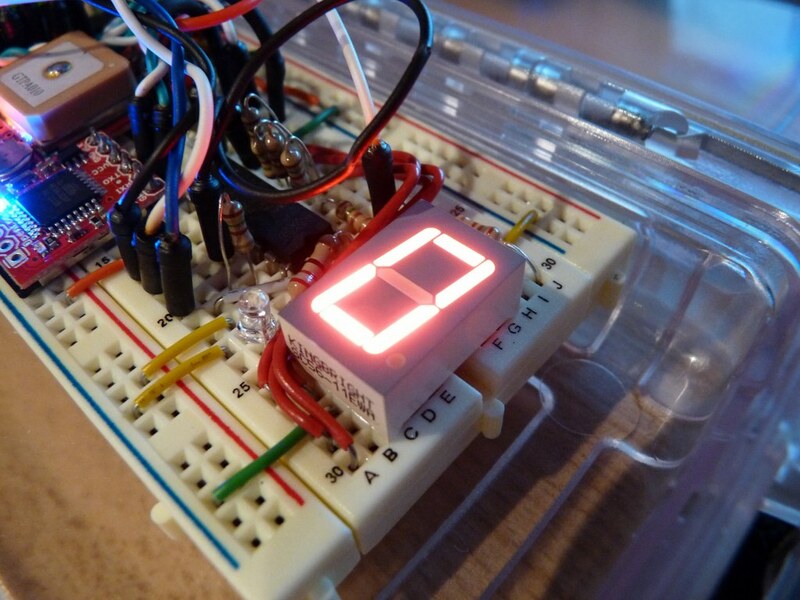 The led digit is driven by a 74HC595 shift register. 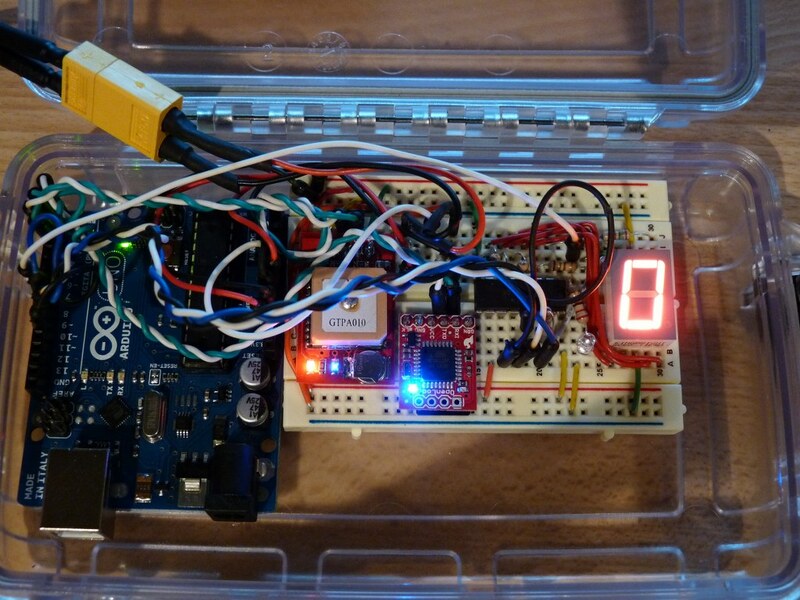 It accepts serial data from the Arduino using digital pins 8, 9 and 10 and switches the different leds of the digit in parallel. 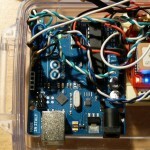 Using a shift register has the advantage that it only requires three pins of the Arduino. 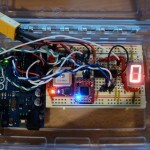 If I wanted to drive the led digit directly from the arduino, I would require eight. Each led of the digit needs 2v at 20 mA, so use 150 Ohm resistors. 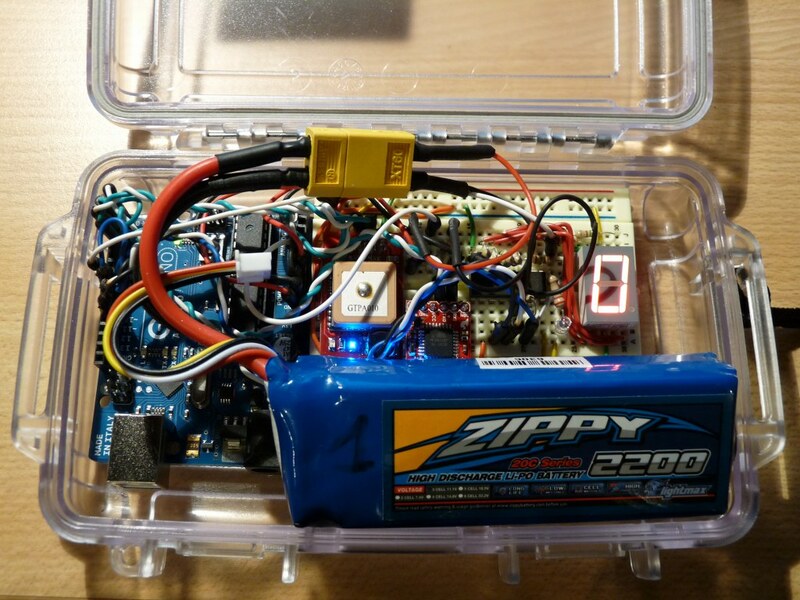 The battery is connected to a voltage divider. 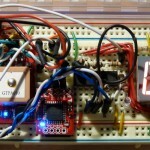 Depending on the battery voltage, it sends a signal between 0 and 5v to pin A0. 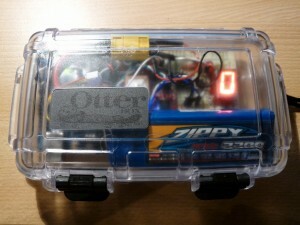 The resistors were chosen so that 5v corresponds to a fully charged lipo, 12,6v. I was lazy and used a voltage divider calculator. This gave me this result: R1 = 150 Ohm, R2 = 100 Ohm. I however measured the real value of the resistors and use those in my code to gain a bit of precision. 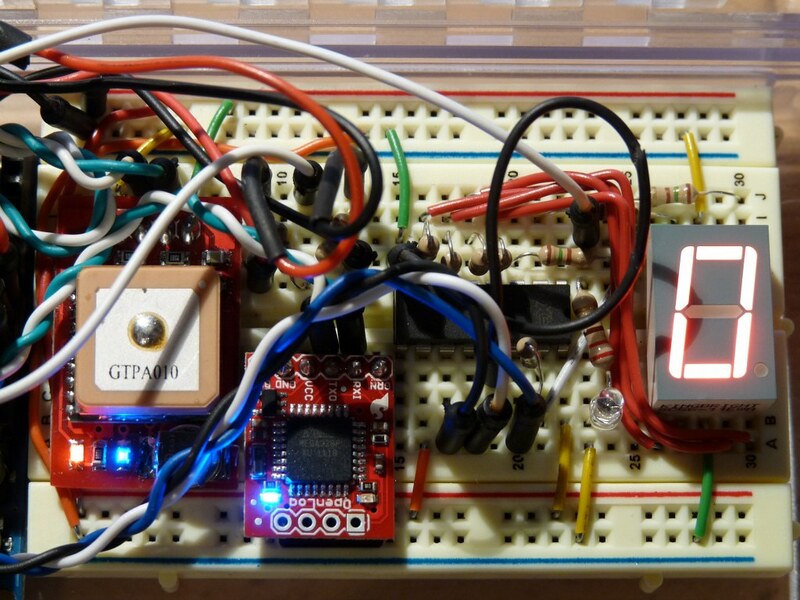 I chose an alarm voltage of 9,6v (3,2v per cell). 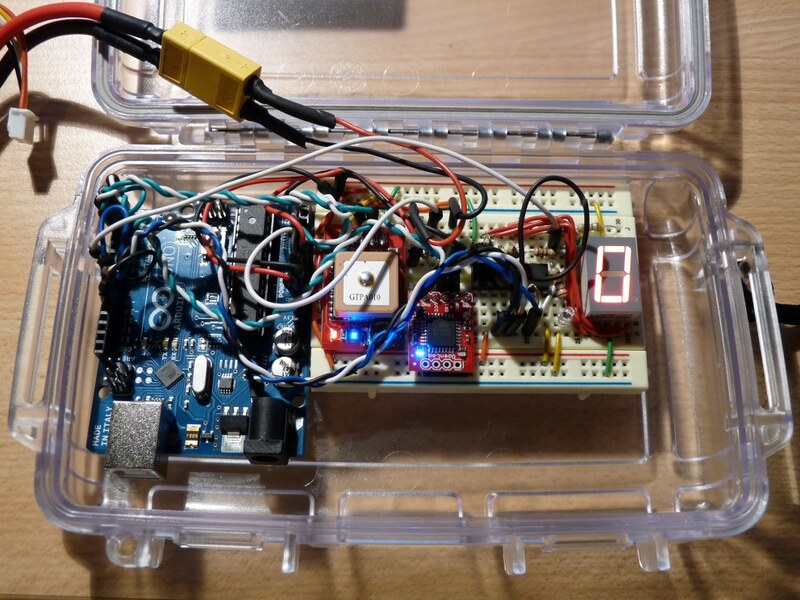 When the Arduino detects a voltage equal or below 9,6v, it will light up the led connected on digital pin 7 (with a 220 Ohm resistor in between). 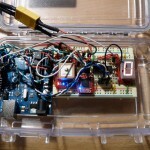 Ideally you’ll want an audio alarm as well, for example a piezo alarm. You’ll need to figure out which led digit pin lights which segment. In my case it was trial and error because it wasn’t as described in the datasheet. I’ve marked the names of the segments in my code (B=upper, M=middle, O=under, L=left, R=right). I’ve made a quick wire diagram in Fritzing. I’m used to Eagle, so bear with me. Fritzing wire diagram. The GPS is missing because there’s no Fritzing symbol for that and I’m too lazy to create it. It only requires four wires: VCC, GND, TX and RX. The last two are connected to digital pins 2 and 3. In this video the blue warning led is missing. This was later added, as seen in above pictures. #define UPDATETIME 5000 //This defines how many milliseconds need to be between each update i.e. 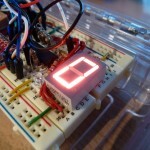 writing the values to the SD card and flashing the LED digit. I’ve measured the current used during signal acquisition with a Watt’s Up meter. The GPS uses the most current during signal acquisition, so I kept the GPS inside the house so it couldn’t get a fix. This should give me the worst case current usage. I measured during 855398 millis, so 855 seconds and during that period the current used was 0,030 Ah. This means that during that period the average current was 126 mA (30 mA * 3600 s / 855 s). 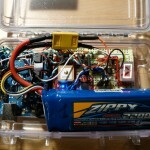 Using a 2200 mAh battery, the GPS logger should run at least (worst case) about 17,5 hours. Already more than enough for what I will be using it for. 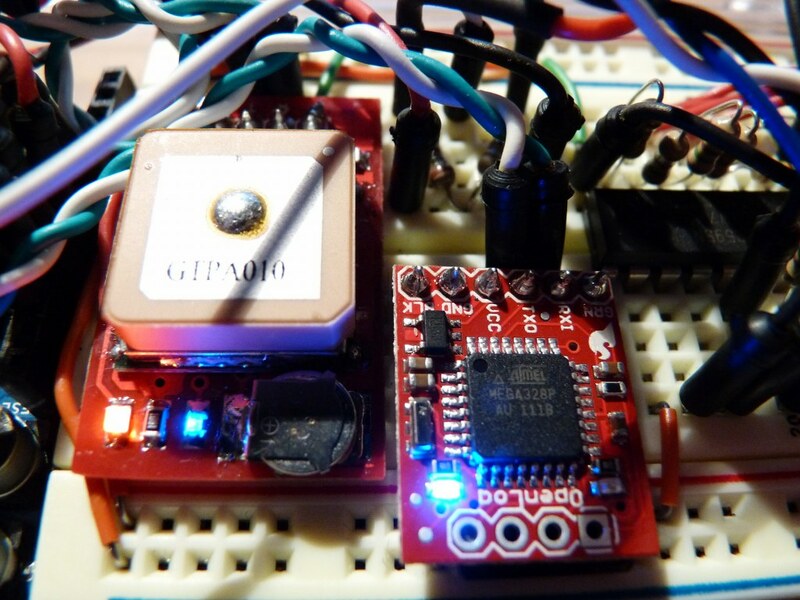 The GPS module uses about 10 mA less when it has a fix. This gives a runtime of about 19 hours. 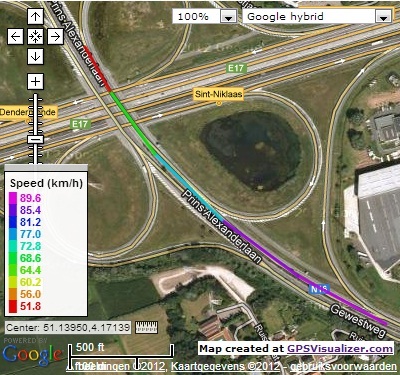 Next you can map the data points using for example GPS Visualizer. I’m not going to fully explain that as GPS Visualizer has a great help/FAQ section.